Someone thought we should have another Mimo Club Penguin Caption Contest so here it is! 1. Come up with a funny, weird or warped line for both Mimo and ZoeZoe. 3. Send your captions to me in a comment. You can enter as many times as you want. We will pick a few of the best ones and let you help us vote on the big wiener. I haven't decided what the big wiener gets. Any ideas? Last day for the Mimo Secret Builders party! Get you Mimo shirt and hat before it's too late! Click here! 10douwgs10 here................... mimo: Oh no run for your lives aliens took part of the forest into the pool room! Zoezoe: mimo wake up! Are you ok? Mimo:OMIGOSH! This pool smells like Cheese! Mimo-Are you sure that should be there? ZoeZoe-I don't know but what I do know is that I cant swim!!!! ZoeZoe-IDK but I just remembered...I CANT SWIM!! Mimo: Omg a new room! Zoezoe: You say that everytime club penguin has a glitch! Zoezoe: Look what I did! Mimo "Why is that there" Zoe Zoe " G said that smelly zebra's came into cp and put tree's and snow eveywhere"
Mimo? One of your biggest fans here! A caption contest? Sweet! I tried to enter but I was on vacation the last time, AWE SWEET! ZoeZoe: and a happy new year! Mimo: Where are we? forest, pool? forest pool? forest, Pool? Zoezoe:Don't look at me, I'm just your little sister. Zoezoe11:How long are we going to have to stand here? Mimo: Uh ZoeZoe, do I see bubbles?? Ew. Mimo: Ah. What a nice day to swim. Aaaah! OW! OW! I just tripped on my own feet and landed on... is that the forest? Zoezoe: Haha! OW! Stupid feet! zoe zoe:Ahhhhhh that hill form the forest got in here!!! mimo: where's a place that you go too if you want cheese thrown at your head? Mimo: I am gonna jump of the rock into the pool! Zoezoe: Why don't I just punch you off the rock Mimo? Zoezoe: Just keep swimming... Mimo what are you eating? mimo: okay, this is definitely cheating. zoezoe: i'm finally gonna win at hide and seek! mimo: Ok I know I said I wanted my own little Island, but i didnt mean in the Pool! zoezoe: meh, at least the tree looks happy. See, its smiling! mimo: Hey zoezoe,look,whats this island doing here? zoezoe: Oh thats where i put it!!! mimo: AAAAAHHHH im being attacked,im being attacked!!! Mimo: Hey zoe, did you put this here? mimo: Oh my gosh Oh my gosh Oh my gosh OMG!!!! ZoeZoe zoezoe!!! Check this out i can swim!!! mimo: Is it too late for jokes? Mimo: Ahhh we fell off the iceberg ahh...I NEED MY RUBBER DUCKIE!!!!! ZoeZoe: Huh what you say??? Mimo: When did they put water in the pool? : AAAAAAH, THE RETURN OF THE SALAD! ZoeZoe: Run for your lives! mimo: zoezoe why is this island in the middle of the pool? zoezoe: NO MIMO!! we went to the forest you started crying because you wanted some chocolate and YOU made a pool of tears!!! mimo:um zoezoe who told you to put that there? Mimo: WOAH! Did they put in new pool water? ZoeZoe: Oh boy. HEEEELLO??? Cant you see that big chunk of the island in the middle!?!?! Mimo: I brought your Scarf back from the Forest!!!! ZoeZoe: Ughhh Mimo you brought the place where it was in the forest and still no SCARF! mimo: hey zoezoe do you want a tour. zoezoe:sure tell me why part of the forest is here. ZoeZoe: You didnt notice anything else? Mimo:Why is there an island in the middle of the pool and why am I smelling dirty diapers? zoezoe:I got some of the forest and now I turned it into a daycare! mimo:zoezoe i thought you said you wouldnt try your magic here!!! Mimo: OH MY GOSH do you see that!? ZoeZoe: Hey Mimo! The Pool turned yellow! Mimo: Oh, where's a bathroom down here when you need one? ZoeZoe11: I told you this goes in the FOREST! Mimo777: We'll, i find it looks perfrect here. Mimo: Oh wow Zoe Zoe, I just noticed how pretty the bottom of the pool is! Mimo: I'm a fat muffin! WOOHOO!!!! I'M A FAT MUFFIN!! WOOOOHOOOO!!! Mimo777: I told you dreams can come true! ZoeZoe11: .... what kind of dream is putting Trees in water? Mimo: hey whatsup, ZoeZoe? Anything weird lately? Mimo: Wow!! you call these trees! I'm as tall as this thing! And you call this an island! i can make a sand castle bigger than this! Zoezoe: Now Mimo, don't be so mean. And you know what... your bing too picky! awesome!! ZoeZoe11: I have no idea, but lets get outta here before it eats us! Mimo777: Do you find something is different here? ZoeZoe11: Besides a part of the forest in the pool & an upside-down crab, not really. ZoeZoe:Is this For Real?They Didnt make any Cheats For the Snow and Sports Catalog????? Mimo777:What?This is The Weirdest thing Thats Ever Happened!We must Invesagate! Mimo- Look what Disney has done with club penguin! Zoezoe:Ok Race ya to the new island. Mimo:Do you see somthing new? Mimo777: Hey look I can blend in with the water now that I'm Aqua. Mimo: Hey Zoezoe have you been to the forest lately? Mimo: Who put this pool here? ZoeZoe: I dunno I mean why put a pool in the forest? Or is it the forest in the pool? I'M SO CONFUSED. mimo: im gonna eat that tree! zoezoe11: well im gonna eat that rock! mimo:i rather have a pet zebra then this! zoezoe:does your zebra fart?! Mimo:Ahhh!My home is in the pool! Zoezoe:Just move to a real igloo! mimo: Hey!!! zoezoe what you upto? zoezoe:Um Then how come you put the island in the pool. Mimo: OMIGOSH!! I LIKE PIE!!! mimo:o my god what is wrong with people these days putting parts of islands in the pool. zoezoe:mimo what do you mean, i think you're illusinating, your really strange mimo. ZoeZoe : no we are just in the pool but how do i explain this island! mimo:i bet you cant lift THAT up! zoezoe: thats how it got there! Mimo:Oh no now we can't swim! Zoezoe:Im going to the cove. ZoeZoe: Really! You just noticed! Mimo: Wa Wa Waaaa! I don't think that suppost to be there. Mimo777:Hey Guys!Anything is possable When you use your Randomness!Look Im Blue Instead Of Orange! Zoezoe11:Um Mimo?Do you notice anything eles? ZoeZoe: So mimo, how do you like the new pool? Mimo: This is the pool? I thought this was rockhoppers boat. zoezoe:i still dont know wats funny? mimo:omg its a fat penguin in the pool aaaaa! zoezoe; hahaha a costume miimo youve been TRICKED hahaha! Mimo: Just keep swimming, just keep swimming, just keep swimming swimming swimming, Hey! Whats with the forest in here. ZoeZoe: MIMO! that's not the forest thats a zeebra who looks like a zeebra. mimo:i told you i am a real magician.I have made a spell next up i will tuen you into a rubber duck. Mimo: This is cause by the galapolis of the earths atmosphere. Zoezoe: Why do you have to be so warped it was because of the simultaneous rotation of zebras playing beach volleyball in the snow. Mimo: What is this? Snow and the pool? What good does that do? Mimo: Hey I think the crab wants to play in the mini forest. Zoezoe: don't let him he just wants to eat my life preserver! Mimo: Finally! Now we can play pirates! Mimo: Wow! Look at this! It's a floating forest! ZoeZoe11: I wonder what it looks like under the water! Mimo: Two great rooms in one! All we need is the puffle shop in the window! mimo:i knew that tree i planted would grow! Mimo: Wow! What an amazing thing to look at! zoezoe:the pool stole a part from the forest! mimo:it also stole my swimming trunks! Mimo:Zoezoe, what did you do? Zoezoe11: What?The water was too hot. Mimo:ahhh the smelly zebras are having their revenge! Zoe Zoe: uhhhh mimo...i thought the giant chicken did it..
Mimo:umm did u notice someone planted part of the forest into the pool? ZoeZoe11:umm where i cant see it because of the big part of the forest someone planted there in the middle of the pool. mimo: the fishie goes moo! zoezoe: i lost my flarga! Mimo: Tours here!!! Tour the newly renovated pool!!! Zoezoe: Newly renovated as in, THERE'S AN ISLAND IN THE POOL!?!? ZoeZoe:what do you think heh? mimo:saweet an island!Wait ive never seen an island. zoe zoe:mimo we are already on an island. Mimo: I LIKE CHOCOLATE PINEAPPLES! ZoeZoe11: I thought it was you, so I didn't want to say anything! ZoeZoe11: oh..you smell that too? Mimo: Uhhh, do u think this is left over from the earthquake? look i got another one! Mimo:cool look sis i caught a noodle. (walks under island)hmm look its a worm crawling out of the roof. ZoeZoe11:(shakes head) its not crawling out of the roof. its crawling out of the bottom of a big part of the forest!RUN!we r being taken over by giant little islands all over our big island. run for ur life! Mimo:that made no sense wat so ever. Mimo I need to go to the island but I need some snacks maybe pizza Zoezooe . mimo:hey ZoeZoe11 wanna go to the forest after we're done swimming? Mimo: Wheres the cast of Gilligan's Island?? Zoezoe: It got cancelled, Mimo!!!!! Zoezoe: What in the name of bananas is that!? Mimo: Looks like we've found our Christmad tree, Zoezoe! mimo : where'd that piece of the forest come from! zoezoe : i used magic! Me Santa: My trees and my rock where did they go! Mimo: What...how did this tree get here??!! Zoezoe: That crab and that polar bear are at it again! Look Mimo! He's laughing at us!!! Mimo: isn't the snow supposed to turn into slush. Mimo777: ZoeZoe! I think theres a hole in the Roof!!! Mimo: Hey ZoeZoe look what Santa gave us for christmas! ZoeZoe: Yay! A swimming pool-erm with a forest in? Mimo what was on your Christmas list?! Mimo: WHERE'S MY PET DRAGON??!! I was hiding him here!!!! Zoezoe: Umm, Mimo...he ran away like a year ago, remember? Zoezoe11: OMG! Mimo do you see that! Mimo: Yeah! The pool has a stain in the corner!!! ZoeZoe: Looks like a mini clubpenguin to me. mimo: where the heck are we forest of pool? Zoe Zoe:Hey!How the heck did that get there! Hope you like it Mimo! mimo: woa ! wen did that get there ?! i think ive smelled too many zebras.... zoezoe: LOOK ! Floating square bubbles !!! Mimo: Hey, if the trees are here, then whats in the Forest? Oh, just Herbert P. Bear. ZoeZoe: Mimo, don't you remember cutting and pasting this last night? ZoeZoe11: Do you see anything..suspicious about this pool..? Mimo777: Hrmmm Nope it looks perfectly normal! mimo : hey isn't that herbert's crab! zoezoe : IT IS! to the mimo-mobile. mimo : penguins don't know how to drive. zoezoe : ok uhhhh let's make a trap on this island! mimo : you really think that that crab will teleport from outside to inside!!! Mimo: Hey , why didn't the snow melt? ZoeZoe: Um, you know that this shouldn't be here, right? Mimo:Who did this? Zoezoe:I dont know and i dont care now we can take a bath with a little bit of nature and no this this is wrong, arrrrr now its leaves in the water! Mimo: Have we grown or something because those trees are nearly the same size as me. ZoeZoe: Okay, well lets think about this rationally... RUN THERE'S A GIANT IN THE POOL! Mimo: Is this suppose to be here? Zoe: No, someone must of turned the thermostat WAY down! Mimo : It worked! I have changed Water to Snow. Zoezoe : Ya, Its called a Freezer. Mimo: Wait...is this the pool or forest? ZoeZoe: I know! It's the poost! ZoeZoe: I know what you're thinking...but I didn't do it!! Mimo: Dude, whats this island doing in the middle of the pool? ZoeZoe: It would seem that Club Penguin Island has shrunk...dude. Mimo:what a nice day for a swim....BANG!!! ZoeZoe:what happened?MIMO YOUR NOT FLOATING!HELP! Mimo: Why in the world has the Forest moved to the pool? ZoeZoe: Oh! THATS where it hid! I found you Forest! That was one good hiding place! mimo:i don't remember this here! Mimo-The sky pooped the Forest's Property! Zoezoe-Strange, Is the forest taking over the pool?!? Mimo: Why does this pool smell like asparagus? ZoeZoe: Don't you know that there is an island... you wet yourself again? Mimo: Why is part of the Forest in the middle of the pool? This is too freaky! ZoeZoe: Dude! Shut up! We could be getting Punk'd! So act normal and don't sound like you're afraid! They think they can mess with us?! PAH! Mimo: Hey, get that weird looking thing out of here! ZoeZoe: Tree's A crowd, ya know!!! mimo: i cant swim in the pool never mind the island! zoezoe:that wasn't a good joke. Iglo20 here.........Mimo:If i were a penguin,this would be paradise! Zoezoe:Uh Mimo we are penguin's and this is weird! Mimo: I want to go swimming! ZoeZoe: Fine you can go but if you trip on a thorn, don't say i didn't warn you! Mimo: OMG! whats this doing in the pool? ZoeZoe: Oh mimo! I guess you did'nt know that I have magic powers! zoezoe:i think it might have got abducted by aliens but im not sure! Mimo777: Hey! Look At the Crab OVA in the corner Of The Window! ZoeZoe:Yet, You Didn't notice the snow and trees in the middle of the pool MIMO! REALLY... WOW! Mimo: Whoa is it just me.. or did the underground pool get colder? ZoeZoe11: Look's like Gary thought he could do more than just fix the pool.. he added a snow island in the middle! mimo: hey zoe, i need a we, where should i do it? in the pool or forest? mimo777: hey Zoe! Look At What Happened When U Left 2 Get Me A Donut! Zoe Zoe11: ummm.... Mimo... That Is The Donut! ZoeZoe: Time for all, that penguins call, every season of the year! I got it off of the Charlie Brown Christmas Song! Mimo: Just what i needed, another island for me 2 hide away from! Mimo: ZoeZoe do Zebras Smell Funny? ZoeZoe: Mimo's been at the communion wine again! Mimo: finally i have some time 2 relax! but whats the forest doing here? ZOE! Zoe Zoe@ HEY dont look at me! it was china! mimo: swimming forest! or is it forest pool?! mimo: o just what i need a forest in the pool with me and my sister, can things get any stranger!! zoe: yea, can i have some time with my brother in a pool for once! Mimo: wow the forest if even after me! i knew i was not crazy! Zoe: mimo? what are you saying? Mimo: why is there a forest in the pool? Zoe: i think it was thirsty! Mimo: ZoeZoe, why is there a island in the middle of the pool? ZoeZoe: I don't know, Mimo. I came here to swim, not to hunt for an island in my local pool! Mimo:OMG run zebras are taking over the world!ZoeZoe:OMG mimo run! Mimo: this is wayyyyyy better then a pet zebra isent it zoe! Zoe: u sure got that right! mimo: hey zoezoe! 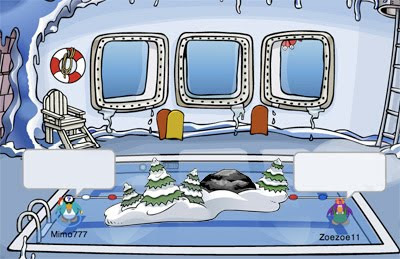 look i built a island to live in and take over CP! mwa ha ha ha ha!!! Mimo: Im so popular the forest comes after me. Island : can I have your autograph Gary! Mimo: Hmm. Nothing seems to be wrong here. ZoeZoe: I know you saw me on a motor boat but come on why are you using a submarine!!! Mimo: Zoezoe, are we in the right room? Zoezoe: Of course, we were supposed to meet in the forest, and we're here aren't we? Zoezoe11: Doesn't our zebra have that? Mimo hi zoezoe! Want to go and smell some zebras? Zoezoe ummmmm...ok but haven't you noticed a giant island in the middle of the pool? Mimo yeah but don't worry i think club penguin is renovating! Yaaaaaaay!!! ZoeZoe-How am i supposed to swim Do you NOT see the island right there! Mimo:Well I guess i brought a forest here. Zoe Zoe: HellO? how can u even brigh one..By the way your sleepwalking. Mimo: I've snuck into another secret room! ZoeZoe: No there was just a few too many puffles in puffle roundup! Mimo: ZoeZoe, you know we can't afford an island, is it going to fall out of the sky? ZoeZoe: No it's chichens eat popcat with hobos when you are eating ice crean on sunday. Mimo: OMG how did that get here? ZoeZoe: Woah that is one huge hole in the roof! Mimo:whats that smell in the pool? ZoeZoe:Mimo! did you cut the chease again?